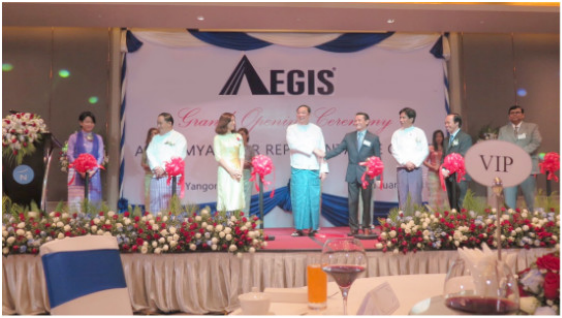 January 23rd, 2016 - AEGIS officially held the grand opening ceremony of its representative office in Yangon, Myanmar with the support of Dr. Maung Maung Thein - Deputy Minister of Finance, Mr. Aye Min Thein, Managing Director of Myanma Insurance and Commercial Councillor Vietnamese Embassy and attended by many distinguished Guests! As Myanmar continue to open up to the world and undergoing tremendous growth, AEGIS is proud to be associated with the vast economic development and bright future of The Republic of The Union of Myanmar. ​AEGIS and our Global Partner are fully committed to Myanmar's insurance industry and to back up this strategy we have opened a representative office in 2015 under the support and guidance granted by the Directorate of Investment and Company Administration. The opening of our representative office in Yangon strongly reinforce this strategic commitment to the country's insurance sector and indirectly facilitating support for all economic sectors through effective risk and insurance management as the country steams ahead. General Manager - Mr. Au Quang Hien said "Our AEGIS Myanmar representative office's key role will be to perform market research, support and liaison activities on behalf of AEGIS and our Global Partners around the world, engage with potential local partners. With this unique "on the ground" presence we will actively interact, build strong relationships with the local insurance industry through training, technical collaborations, as well as providing a gateway to the experience, know-how of regional and global insurance and reinsurance markets."